There are few situations in life as intense as a pit stop during a championship auto race when a small crew of mechanics is able to change four tires, refill a gas tank, and perform any other number of checks and repairs in a matter of seconds. For the racecar driver, the pit crew’s efficiency, cooperation, and successful execution of these stops can mean the difference between winning or losing—or even life and death. There is no room for sloppiness, no room for error. The people—and the parts—need to be there, and they need to work, seamlessly. The pit stop strategy is one of the most important parts of winning a race. And so it is with unrooted cuttings. Just as the race car driver needs a sound pit strategy and a fast and efficient pit crew to win a race, a crop of fresh cuttings needs a winning “sticking strategy” to make it across the “rooting” finish line to become mature, healthy plants that will sell. In both cases, it’s a race against time and circumstance. Fragile cuttings need to be stuck as soon as possible to fend off disease or even death, and they need to be carefully monitored, nurtured, and protected until callus and root formation. In other words, your unrooted cuttings not only need a sticking strategy but a “sticking crew” — like a pit crew (but with cleaner hands). How do you make sure your sticking crew and your greenhouse, your “pit lane,” will be ready to go when cuttings arrive? And how do you make sure your cuttings survive and thrive during their critical first days? We’ve put together a list of 9 keys to help you create a winning strategy. #1) Clean and Disinfect your Growing Environment. Whether you’re buying unrooted cutti ngs from a supplier or harvesting them from your own stock plants, you’ll want to start the season clean. A pit crew member wouldn’t dream of putting dirty oil in a race car, and likewise you should make sure the “engine” of your operation is running clean. A clean environment is your best defense against persistent diseases like Botrytis, Erwinia, and the fungi that can cause damping off—Pythium, Rhizoctonia, and Fusarium. Clean and disinfect your growing environment and tools, including cutting tools, pots, misting lines, benches, etc. If contaminated, all are capable of spreading disease, which could rapidly wipe out your tender young crop. Remember that cleaning and sanitizing are two separate and necessary steps. You first need to clean away all debris before applying an appropriate disinfectant because debris will block the action of the disinfectant. Use Phyton Corporation’s X3® at a rate of 25.6 ounces per 100 gallons of water or 7.5 ml per gallon of water to sanitize all surfaces, tools, and pots and to disinfect misting lines. 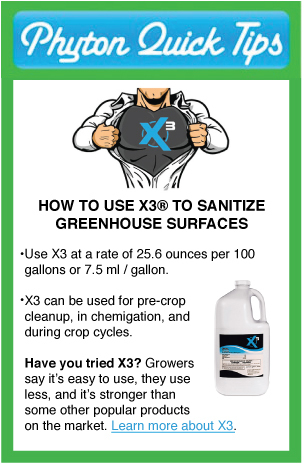 Used at this rate, X3 is safe to use over plant materials and cuttings. Keep in mind that diseases love complacency. Don’t allow a few disease-free years, if you’ve had them, lull you into a false sense of safety. Be vigilant. #4) Sticking. This is when your sticking crew needs to swoop into action like a pit crew in the middle of a race. Proper handling and timing are of the essence when it comes to the cuttings’ ability to survive and thrive. The cut that created them is a gaping wound that will become fatal unless quickly “dressed” by sticking them in clean, pre-moistened rooting media (pH of 5.5-6.5) and providing mist. Sanitation in this process is critical, and workers should frequently wash hands, gloves, and tools with an appropriate disinfectant. As with a pit stop, there is no room for sloppiness or cutting corners. Dibble the rooting trays prior to sticking to avoid further injuring the plant; cuttings should typically be stuck about 1/4-1/2 inch deep. If cuttings are not equal in size, you’ll want to resize them to achieve uniformity. Stick ethylene-sensitive plants, like geraniums, first. Do not stick any cuttings that look unhealthy or are diseased. If using rooting hormone, either dust the cuttings individually or dip in very small batches using disposable containers to avoid the potential spread of disease. To ensure a disease-free start, cuttings may be dipped before sticking in a broad-spectrum fungicide, such as Phyton 27® or Phyton 35®. While some growers prefer to wait and spray a few days after sticking, a dip offers immediate protection at full strength—waiting allows time for infections to start, and any spray applied may be diluted by moisture in the soil. Dip cuttings for a few seconds in a Phyton solution, using 15 ounces per 100 gallons or 1 teaspoon per gallon. Phyton 27 and Phyton 35 have a low risk of phytotoxicity when used as directed. As with any chemical, always use according to labeled instructions. 5) Misting. Mist the cuttings immediately after sticking with very fine droplets, using warm water (70 degrees F). You may want to make it someone’s job to follow behind the stickers with a mist nozzle. The cuttings will need high humidity, or almost constant misting or fogging, until callus formation. The idea is to keep a light film of mist on the cuttings, but to avoid wetting the substrate. Cuttings should be kept turgid, and right on the edge of wilting. Too much water will leave the cuttings vulnerable to diseases like Botrytis, Rhizoctonia, and Erwinia and will lead to poor rooting, while too little water will result in curled up leaves. Remember to take weather and temperature into account in your misting schedule; cuttings will need more mist on sunny days and less on cloudy days. Once the cuttings callus, you can begin weaning them off misting, starting by cutting back on night misting. #9) Disease control. The warm, high-humidity environment necessary for propagation is also the ideal environment for disease formation. A disease break-out could result in the greenhouse equivalent of an unscheduled pit stop in a race: suddenly your back is against the wall trying to repair damage or remedy a disease and still make it across the finish line. Using sound cultural practices combined with a preventive fungicide treatment can help you avoid such a scenario. Treat your crop with a broad-spectrum fungicide spray within a day or two of sticking to provide effective protection against diseases such as Botrytis and Erwinia. Then, after roots develop, use a fungicide drench at the preventative rate to protect against Pythium. Phyton 27 will prevent or eliminate any bacterial or fungal diseases that are present and get your cuttings off to a healthy start. Apply Phyton 27 at a rate of 15 to 25 ounces per 100 gallons or 1 to 1¼ teaspoons per gallon. 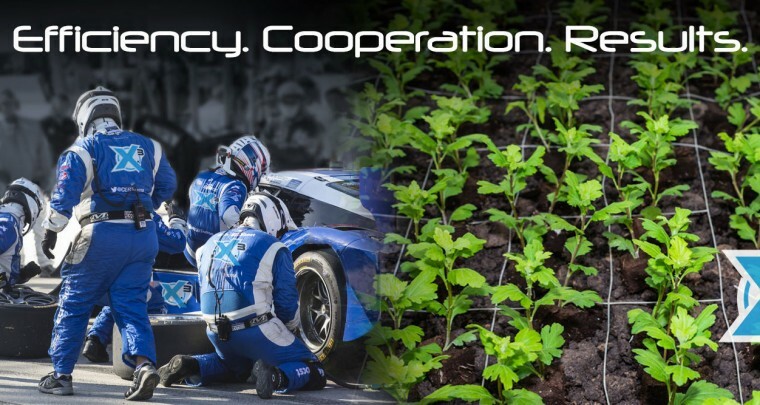 Just as winning a championship auto race demands not only speed but precision, expertise, and teamwork, so does the successful propagation of vegetative cuttings. There are many elements that need to come together in order for fragile cuttings to survive and thrive throughout the process. Missing any of these elements would be akin to a mechanic forgetting to bolt a tire back on: disaster is sure to follow. By taking the 9 keys above into consideration, you can create a sticking strategy that will get your cuttings across the finish line with flying colors. NOTE: These tips are provided as general guidance; specific needs will vary depending on the plants you are propagating. Check with your supplier for specific handling instructions.